Is there a little too much shame in your office? Distracting alert dialogs? Blaring sirens bothering co-workers? Following the screenshot above and clicking on "1 Second" will toggle the setting, thus disabling the chirp-on-check-in feature. Following the screenshot above will decrease the amount of time that the lights flash whenever "Lee" breaks the build for the first time on "Project 1" (perhaps as build manager he breaks it frequently). Shaming build breakers doesn't have to annoy co-workers. Hopefully now you are able to accomplish one without the other ... or more effectively accomplish both. 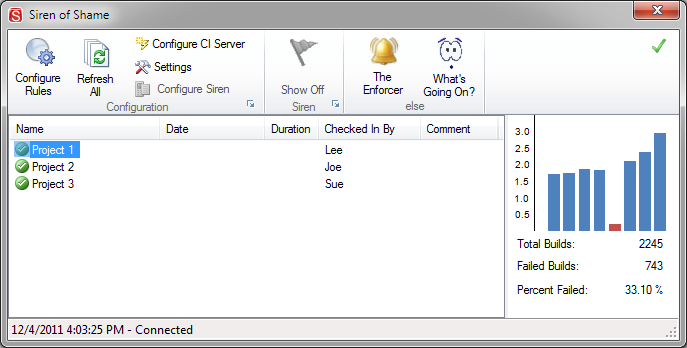 The software now maintains a history of check-ins for reporting purposes. At present it will miss anything that occurs when it's not running. In other words if you go on vacation for a week your stats will be different than your co-workers. We're working on a fix for this, but let us know if you think this is a big deal or not. The goal of reputation is to add an element of good-natured competition and fun to your project while simultaneously trying to decrease the amount of time wasted resolving source control conflicts, fixing broken builds, and/or waiting on broken builds. 2. Encourage team-members to run tests prior to check-in to decrease chances of breaking the build. We intend to add more sophistication to the algorithm in a future release (e.g. incorporate code-coverage), but we would love to hear any feedback on what we have now. If you really don't like the idea of reputation you can turn it off in settings. The chart on the right shows build durations for the last eight builds. A blue bar indicates a successful build. A red bar indicates a failed build. The Y axis shows duration in minutes. The X axis goes from oldest to newest. Click on a build on the left to show the chart on the right, click off a chart to go back to the user/reputation view (unless you've turned it off). We're proud of the latest updates and we hope you'll like them. Please don't hesitate to give us feedback on twitter @SirenOfShame or via e-mail: "support" at our domain name. If you auto-updated the software within the last 12 hours and are receiving an error about a method missing in UsbLib.dll it is because we failed to update one of the dll's in the auto-update package. The msi installer was not affected by this omission. If you are in this state now will need to uninstall and reinstall the latest version. We have fixed our deployment process so this should not happen again. Sorry for any inconvenience. We just released Siren of Shame 1.1.0 to our Google Code site. We officially published our website today. The url is: http://www.sirenofshame.com. Since we are not officially selling build monitor sirens yet you may pre-order sirens from http://www.sirenofshame.com/PreOrder. The fun part is if you provide a twitter account upon pre-order we will have @sirenofshame automatically follow you and mention you. We also list everyone that's pre-ordered as "favorite people" on the left side (unless you check the anonymous check-box). Hopefully we can create a community of people around our fun product. 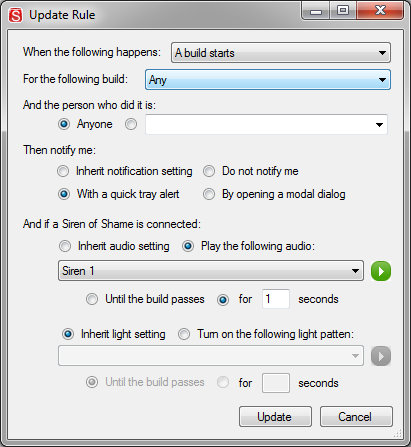 As you may know the build monitor portion of siren of shame is open source. If you wish to contribute or heckle the code is at: http://code.google.com/p/siren-of-shame/. We also published our forums today. It's free to create an account. The phpbb site isn't branded yet, but if you have any issues or questions feel free to post at: http://www.sirenofshame.com/forums/index.php.